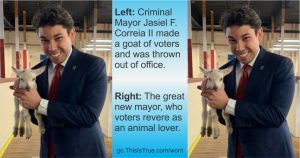 Jasiel F. Correia II was mayor of Fall River, Mass. But he was facing federal charges of tax evasion and fraud, so there was a recall election. He lost: more than 60 percent of voters decided he should go. But the same ballot asked a second question: who should be the new mayor? Five candidates ran, and the plurality of the vote, about 35 percent, went to the incumbent. 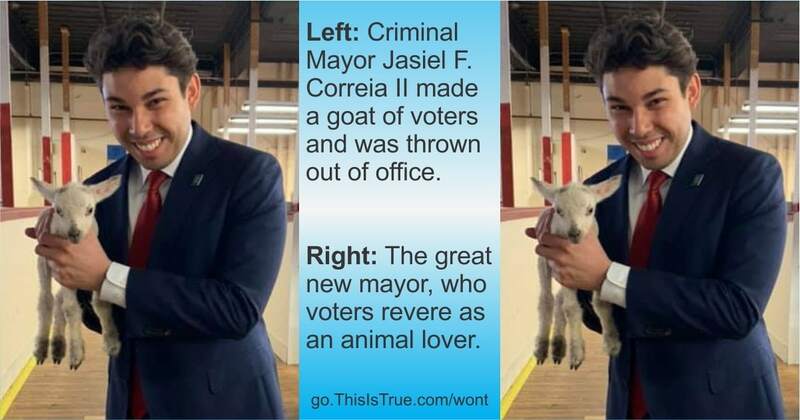 So now, having been recalled from office and elected to replace himself, Jasiel F. Correia II is mayor of Fall River, Mass. (AC/Boston Globe) …Still think letting the person with the most votes win is the best way to determine the will of the people? There are other ways to determine what counts as the will of the people. For example, I think single executive positions should be filled by some system where each voter gets to vote for all the candidates they like, not just one. Consider an election where 49 percent of the people think candidate A would be the best choice and candidate C would be terrible, 48 percent think it’s the other way around, and everyone agrees that B would be a pretty decent second choice (except for the 3 percent who think B is best). Why not have a voting method that makes B the winner? This way, we wouldn’t have nearly half the voters thinking that the head of our country’s, state’s, or city’s government is terrible. Isn’t a candidate we all think is good a better reflection of the will of the people than one nearly half of us think is terrible? Or, as in this case, a candidate three fifths of the people voted to remove? On the other hand, I think legislatures (or at least one house of each legislature) should be elected at large by proportional representation, under rules that make it fairly easy for even a small minority party to get one seat. This way, we can all be heard, and new ideas can have legislative champions. Isn’t a legislature where everyone has a representative who shares their views (and more popular views have more representatives) a better reflection of the will of the people than one where some people aren’t heard because the people who happen to live near them disagree with them? I’m not very confident in my views on these points, but I think they’re plausible enough that we shouldn’t consider it obvious that a plurality vote defines the will of the people. And I think this story is a perfect illustration. The will of the majority was specifically that Jasiel Correia no longer be mayor, but that was overridden because a minority voted to reelect him. Another voting method might have enabled the majority to get its way. For example, imagine the town had used approval voting. In the actual election, Paul Coogan was a close second; the other candidates, besides Mayor Correia, were Joseph D. Camara, Erica Scott-Pacheco, and Kyle Riley. If a reasonable number of Camara, Scott-Pacheco, and Riley voters also voted for Coogan (and no one who voted to recall Correia also voted to reelect him), Coogan would have finished ahead of Correia. And considering that a majority specifically voted to make Correia no longer mayor, electing anyone but Correia would have been more plausibly called the will of the people. Of course, Correia’s reelection might also have been prevented by a rule that says you can’t run for reelection at the same time as you’re the subject of a recall election. But suppose (and this is purely hypothetical!) that most of the voters who backed Coogan, Camara, Scott-Pacheco, and Riley preferred Correia to any of the non-incumbents besides the one they voted for. In that case, under approval voting, most voters might have voted for Correia even if they also voted for someone else. And if the overwhelming majority of voters approved of Correia while a majority of voters disapproved of each of the other candidates, wouldn’t it then be clear that the will of the people was actually to keep Correia — at least until someone they liked better than the other available options was found? I decided to move this to my blog since there were a lot of reader comments. Rather than try to have an interactive discussion in the newsletter, I’m moving them to the Comments section, just below. I have set each comment’s date/time to be when it was sent to me. Yes, your voting system over there is really unlike ours. Over here we have a preferential voting system. In your last election for example, Bernie Sanders voters’ second preference would have been for Hillary rather than Trump. That would have easily made her the winner as no one got a clear majority on first preference votes. It is my understanding that in places like France and Russia, and I sure many more, the candidate who gets the most number of votes is not elected unless that get more than 50%. Desired effect but less than convenient. But in Australia, a country as large as the US lower 48, we do the same thing, but all in one day. We call it preferential voting. Australia as “large” as the US? In square miles, yes, but in citizens and voters, about 1/15th the size. Yes, I DO still think the most votes is the best way to determine the will of the people. But I never said the will of the people was best. Alexander might be interested in the proportional voting system we use in Australia (for the lower house). For the upper house (federally called the Senate) we use some other very complicated system which has managed in recent times to get people who had a very low primary vote elected through preferences. We have a state election in NSW the Saturday and a federal election some time in May. Both of which look like the incumbents will be seeking new employment. The results from “The Won’t of the People” was at least part of the idea behind Maine’s rank choice voting. We elected our unpopular governor twice by a simple plurality, so we, by referendum, instituted rank choice voting. We had to vote for it more than once because he kept finding loopholes to keep from implementing it. In our last election for US Representative for the second district (Maine only has two), there were two people running who had a clear plurality, both in the high 40 percentiles. One, the incumbent, would have barely won without rank choice voting. Enough people who voted for any of the other candidates as their primary pick put him as last choice (because of the things he had done against the will of his constituents) that he actually lost after second choice votes were counted. He fought it in court for a while until he found out he would have to pay for the entire court battle if he lost. Maine is like that. Mainers don’t forget quickly. There is a method of electing that solves these and other problems. It is called Ranked Choice Voting. RCV simultaneously takes away the ‘spoiler’ effect of third party candidates while actually giving third party or independent candidates a real shot at sometimes winning. Here’s a good website about the voting methods you mentioned. I even used three of those methods — plurality/majority, Borda count, and Condorcet — to determine, among five weekends, when an online food-related group will get together this summer. Fortunately, all three methods agreed with each other. Your story is indeed thought-provoking, and I am pleased that you let Alexander expand his views. However, the “best” voting procedure is a very delicate and mathematically complicated issue. All the suggestions in your writeup may sound reasonable on the surface, but they also all will give some very unreasonable results under some circumstances and/or can be severely manipulated. Arguments like “I think” or “it seems reasonable” really do not carry much weight. This is serious mathematical business, and many mathematicians (including one of my colleagues) have made extensive research on the matter. Please consult some of that before you let your feelings loose in public. Otherwise you are usually very rational in your views. Sometimes I write thunderingly; sometimes I use weakening words. I’m usually quite deliberate in that decision. In this case, I said things like “it seems” precisely because, as I said, I’m not very confident in my views about what voting systems we should use. And that is in part because I’m well aware that a lot of complicated work has been done on the subject. But I wasn’t trying to say the final word (as if I ever could!). True isn’t always the place for that, especially on a complicated matter like this. This publication is supposed to be thought-provoking, and if I can make readers consider whether something they’ve always taken for granted is a mistake, I’ve accomplished that mission. I think what I wrote should suffice to make people who’ve always assumed that you conduct elections by giving each voter one vote and seeing who gets the most votes consider other alternatives. And I think I gave some reason to think that it’s worth considering something along the lines of approval voting for chief executives and proportionate representation for legislatures. That’s all I set out to do. Oh, and one other thing: I’d be interested to see your example of a result from approval voting that’s more absurd than I can come up with for plurality voting. While I think this story is a great example of why an election being won by the candidate that receives a plurality and not a majority of the votes is clearly not representing the will of the people, approval voting also has a significant limitation, in that it can result in the candidate that is the preferred choice of the majority not winning the election. Ranked choice voting, also known as instant runoff voting, solves this by only counting the vote for the second (or third, etc.) choice of a voter if their preferred candidate has been eliminated. Plurality election is the primary force driving the polarization of our country. Third party candidates become “spoilers” that draw support from the candidate from the major party that more closely aligns with their views. This can lead to the candidate from the other major party winning with less than a majority. Because voters are aware of this possibility, they often choose not to vote for the third party candidate even though they prefer them, and instead vote defensively for the major party candidate that they think is the only option to defeat the other party. The same thought process occurs in primaries, where more weight is given to the candidate that can defeat the other party rather than to the candidate that would actually be the best to represent the people. I would love to see ranked choice voting become the norm, and see three to five candidates with differing views be put forward. Voters who agree with some of the Republican “ideals” and some of the Democrat “ideals” could select a candidate that more closely aligns with their views instead of having to make the black and white decision of throwing their support behind one party or the other, and thus being assumed to endorse everything the party stands for. In British Columbia, Canada we have just gone thru a process of voting for a change in our voting system, i.e: one of the several “Plurality” systems vs First Past the Post as we have always historically had. There were many very interesting and valid arguments on both sides of the discussion but in the end First Past the Post Won by a significant majority. The one system that was not discussed here in BC, I presume due to the cost, was one that is done in some countries and by your (and our) political parties to select their respective leaders. I know that it would take some time and patience by the electorate but when the candidate with the lowest number of votes gets removed from the ballot on the next vote until one candidate gets 50%+1 votes in their favour in the end the voters get a candidate who at least has the majority of support. In Canada there is no way to “remove” a politician by recall or (un) popular vote but if there were it seems to me that it would be ridiculous that the politician so un-elected would be allowed to have his or her name included in the next election to replace them. Thanks for your really interesting blog. OMG — what a marvelous item. Wish you could make this part of Randy’s Random so it can be shared on its own. My father propounded his own version of elections; he suggested each voter cast either a vote ‘for’ or a vote ‘against’ a candidate. When politicians start getting elected by negative votes, it might get their attention. Of course, this does allow the possibility of minority parties sneaking in under the radar. I always thought every ballot should have “none” as one of the options. If “none” wins, everyone on the ballot is out and start the process over with a new set of candidates. Of course, here in the US, there will never be any kind of rhyme, reason, logic, or common sense in elections. Our “elected leaders” delight in muddying the waters, re-drawing voting districts to give them an advantage, campaigning not on what their policies are, what they want to accomplish, or anything else, but rather, hammer their opponents, not for what their actual policies are, but rather, what they WANT them to be, and campaign on fear. Fear what would happen if my opponent is elected instead of me! Then, to make things worse, not only are you forced to feel that it is un-American if you do not vote, but your vote literally doesn’t even count. On top of that, you’re stuck with only two parties, because as greed and money rule the world, no other political party could ever get enough cash to be a threat to the 400 year old geezers that dominate politics. Because, I LOVE when an old fossil who doesn’t know he is dead tells me in minute detail what I should do and how I should live. So, as a result, you pick one party of the two, and religiously absorb everything your party says, being able to parrot them on demand, while ignoring anything that does not meet the strict standard of meeting what your party tells you it wants you to believe. It is very possible that a known crook was still the best of the options in the new election. Alexander asked for an example of how approval voting might go wrong, here’s a couple I came up with off the top of my head. (Some of these also apply to ranked choice). Just 2 major candidates, A is first choice for 49% of the vote but A’s supporters are more generous/less committed/indecisive and 11% also vote for candidate B. 10% of the voters don’t vote for A or B and vote for various alternate candidates. B is only first choice for 40% of the vote but B’s supporters are fanatical and refuse to vote for anyone else, B wins. Approval (and rank choice) voting can favor those who have the more fanatical supporters not necessarily the most generally acceptable candidate. Candidates and political parties will figure that out quickly and orient accordingly — do we really want a system that rewards fanaticism? 3 candidates, A & B are strongly liked by 40% but strongly disliked by 60%, C is disliked by pretty much everybody but both A’s and B’s voters also vote for C because as much as they dislike C they dislike B or A more. C wins by a landslide. You can’t rely on voters to strictly vote approval, they will vote disapproval as well by voting for those they don’t like as a safety against the person(s) they hate (anyone but A!). Approval voting can actually be disapproval voting, i.e. the person who is least disapproved of wins, but least disapproved isn’t the same as approval. Again, parties will figure this out and you could well see an increase in negative campaigning as it becomes more important for your opponent to be strongly disliked than it is for you to be liked. 5 candidates, each voter likes 2 of the choices but won’t vote for the other 3. However, there isn’t any candidate that is liked by a majority, all are disliked by a majority, the vote winds up evenly split between all 5. Each candidate gets about 40% of the vote, who wins? How do you pick for a run-off election? By increasing the incentive for alternate candidates you increase the chance that there will be no majority winner. Imagine a ballot with dozens of candidates. 5 candidates, again no one is liked by all, one candidate isn’t anyone’s 1st or 2nd choice, but they are the 3rd choice for 51%, they win. Again, you don’t have to be liked, you just have to not be strongly disliked. 3 candidates, 55% vote for candidate A but 20% also vote for C. 45% vote for B but knowing A would otherwise win 40% also vote for C, C wins with 60% (only happens under approval voting, not ranked choice). The problem with all voting systems is that candidates, parties and voters know the rules and know how to game them. If I am fanatical about someone then I know my best bet is to only vote for them hoping for some crossover support from other candidates. If I absolutely hate someone then I know my best bet is to vote for everyone but them. Candidates and political parties will encourage both of those voting strategies to their own ends. Alternate candidates will look to abuse the system as well. If I’m considering running and I see polarization my best bet is to manipulate that polarization so that I’m seen as “well at least they’re not X” by enough people. I don’t have to run on anything just run as “not A or B”. A new system doesn’t just change outcomes, it changes who runs and how they campaign, it changes who votes and how they approach voting. As such you can’t just translate today’s world into the new system, you have to figure out what the world would look like under that system. As to the legislative voting system, you can get 10% of the populace to believe just about anything (20 years after his death 10% thought Elvis was still alive). Right now those 10% have little impact on Congress (even if sometimes they are catered to at election time). Under a national vote system there will be times that 10% will be electing the swing votes in Congress — which would give them outsized influence and power. The reason for geographically based representation/elections is that we aren’t just a nation of individuals, we are a nation of communities. Not all issues are national or even statewide in scope, some are regional/local. If our system were strictly federal then that wouldn’t be an issue, but as more and more things are pushed up to the national gov’t it is more important than ever that communities have a national representative (which is why I loathe gerrymandering). That said, I could see adding a 3rd house with nationally elected representatives. You’re right, of course, that voting systems shape the candidates and campaigns we get. But so far, I don’t see a case that convinces me that approval voting would change either the candidates and campaigns or the outcomes for the worse. 3 candidates, A & B are strongly liked by 40% but strongly disliked by 60%, C is disliked by pretty much everybody but both A’s and B’s voters also vote for C because as much as they dislike C they dislike B or A more. C wins by a landslide. I think that’s the best possible result, given those three candidates. Everyone is a bit disappointed, but also somewhat relieved. Nobody is stuck with the candidate they hate. In this scenario, the system may be rewarding fanatical voters, but it is probably punishing the more fanatical candidate. If Candidate B had alienated Candidate A’s voters (or had done so to a greater degree), they would not have voted for him (at the same rate). So the incentive here for candidates is still to reach out to everyone. And I doubt a candidate is going to be able to build that fanatical base of voters without alienating people who might choose him second — unless his voters are only fanatical in that they dislike A for reasons B can underscore without alienating people who like A. If I’m considering running and I see polarization my best bet is to manipulate that polarization so that I’m seen as “well at least they’re not X” by enough people. I don’t have to run on anything just run as “not A or B”. This does concern me a little. But consider that A and B also have an incentive to turn people away from you. So you’re probably not going to get away with getting a ton of votes without anyone knowing anything about you. You’re going to have to show that you’re better than A (from B voters’ perspective) and better than B (from A voters’ perspective) — even if that just means defeating A’s and B’s attempts to paint you as terrible. If you’re incompetent or immoral, they’ll probably show that, and you’ll lose some votes. On the other hand, if you’ve got a respectable record but not many people either hate you or are excited about you, you’re just the sort of candidate I’m suggesting should defeat candidates whom about half the electorate hates. If our system were strictly federal then that wouldn’t be an issue, but as more and more things are pushed up to the national gov’t it is more important than ever that communities have a national representative (which is why I loathe gerrymandering). That’s because we humans are pretty bad at imagining how things can change, in particular, how they can change for the worse. It takes work and practice to do that, its a skill few manage to master (I certainly have not). I think you’d be shocked by just how different things would be. Not overnight, and certainly not the first election, but you have to remember we’re talking about a system that has to last. Decades and centuries down the line those incentives will influence things and experience will teach candidates and parties how to best manipulate the system in ways we simply cannot imagine right now. I might agree with you if we were merely selecting the chief administrator but we’re talking about someone who not only needs to administrate they need to *lead* — especially in the case of the President. Someone who wins by not sticking their neck out is hardly a leader and someone who runs on “I’m not them” is free to be anyone they want after the election. The people need to be voting on a direction they want the gov’t to go. Yeah, but not in the way you think. Take Trump in the primaries, he did what I came to call spaghetti campaigning. He just threw things out there to see what stuck to the wall. Nothing stuck with everyone but a lot of different things stuck with some group. “Build the wall” got group A’s fanatical support even though they disliked other things about him. “Fix the trade deals” got group B’s fanatical support. Group A didn’t care one way or another about trade deals, group B didn’t care about the wall and some even thought it was silly or a phony promise (I heard many say as much) but it didn’t matter, he had sold them on *their* issue. It helped that Trump was well know to “exaggerate” or say things off the cuff, if Trump said something group A didn’t like they discounted it because of his history and stuck with Trump because he was going to build the wall. Same with group B, they figured Trump was being hyperbolic about the wall but was going to address their issue. I listened to these people during the primaries, it was simply amazing how Trump put together a coalition of single issue voters on so many different issues without alienating the other single issue voters. The most common phrase I heard in discussions about Trumps various policies was “yes, I don’t like that, but, he’s going to do X”. Trump was/is an anomaly, he managed to get away with it because of his personality and reputation, change up the voting system and we will probably see a lot more spaghetti campaigning. Not as much as they have an incentive to turn them away from B or A. If in A’s mind C is better than B then they’ll campaign harder against B. When push comes to shove if A is looking at a possible loss and between B and C they prefer C their voters will pick up on that and act according. Same with B’s supporters. But that doesn’t mean C is a good choice. Perhaps both A and B prefer C because they known C will be a weak leader and do a poor job and so will be easier to defeat in the next election. A may know that B is a strong leader and while they don’t agree with B’s policies A recognizes that B would lead the gov’t well and thus is more of a threat to them, both in terms of winning the next election and in terms of getting those policies implemented. Better to have the gov’t muddle along until the next election than to go in the “wrong” direction! When you get down to it, going with candidate C is voters not facing the hard choice and kicking the can down the road. There’s nothing to say they won’t kick the can down the road in the next election and the one after that and … when/how do you force voters to make a real choice? The fix to gerrymandering that I’d like to see is for people to self-assemble their districts. Probably at the precinct level you’d vote on which district you want to be in (limited to geographic restrictions), it’d need some kind of priority voting system in case the first choice isn’t available (i.e. it has already reached its population cap). The votes are fed into a well-known public algorithm and the districts are drawn accordingly. So if a chain of suburbs felt more connected to each other than their neighboring urban and rural areas, you could well see the kind of districts you are talking about. I doubt it’d happen all that often though, I live in the Dallas-Fort Worth metroplex, there is a world of difference between Dallas and Fort Worth suburbs. I also think you are forgetting the importance of a representative having a constituency. In a national election, who is *your* representative? Who is that representative’s constituency? Where does the representative have their office? With the vote secret, how do you prove to a representative that you voted for them (and so are their constituent)? Who’s constituent are you if the person you voted for lost? An even bigger catch is how do guarantee that 435 people will get a significant number of votes? A well known name (say a Kennedy) might get tens of millions of votes, far larger than a single district leaving fewer votes for the lesser known candidates to split. You could have Congress people elected just because they have a larger set of family and friends than their competition, i.e. they could be elected with less than 100 votes. How would you ever get rid of an incumbent? They don’t have to finish first to stay in office, they just have to have enough votes to finish in the top 435 — that’s way easier to do than today and we have a horrible problem with incumbency as it is. And this, to me, is all the more reason to support approval voting. We expect too much leadership from our presidents; they should be more like chief administrators. The direction of the country should not be set by one election every four years in which nearly half (or even more than half!) the voters voted for a losing candidate. Yet under our present system, in the past ten presidential elections, the winner has carried more than 55% of the popular vote only once: when Reagan was reelected. The direction of the country should be set less by the president and more by Congress. The president should be someone we can all trust and respect. Who’s constituent are you if the person you voted for lost? I envision voting by party, so fairly few people would probably vote for parties that won no seats at all, especially if there were 435 seats up for grabs at the same time. But whose constituent am I now? If I call Marcy Kaptur’s office and an aide looks up my registration — which is public information, including my party affiliation — she’s likely to think there’s no point trying to get my vote. On the other hand, my favorite congressmen, who are from neighboring states, know that I can’t vote for them anyway. An even bigger catch is how do guarantee that 435 people will get a significant number of votes? I don’t expect to elect 435 individuals running separately. First of all, as I said in my original comment (the one Randy included in the body of the post), what I’m talking about is proportional representation of parties. So presumably there’d be somewhere from four to a dozen parties, each with a ranked list of candidates. If the Democrats and the Republicans each get about 45% of the vote, they’ll each get about 45% of the seats; most likely, the best-known Democrats and Republicans will be at the top of those lists, but some less-famous ones will be high enough on the lists to get in. Meanwhile, if the Libertarians and the Greens can each get about 5%, they’ll each get about 5% of the seats, perhaps led by Justin Amash (now an R) and Alexandria Ocasio-Cortez (now a D), or their equivalents, respectively, since such figures might not be able to get high enough ranks on their parties’ tickets. Second, there might not be 435 seats. If we were electing the House this way, 100 seats might be a better number. Or we might leave the House as it is and elect the Senate this way, perhaps just 10 senators every other year, for staggered six-year terms. Ah, getting to our fundamental differences here. The whole reason we have a chief executive is precisely because the country needs a leader. One person to make the hard decisions when there isn’t time for extended (weeks, months, years, decades) debate. Congress should lead when it comes to what the *law* should be, they are legislators first and foremost (we do agree somewhat in that I don’t think the President should be “chief legislator”). Secondarily Congress is there to check the executive (oversight, budget, etc.) to make sure they don’t step out of bounds. One of the beauties of the system is that the natural tension between the two branches keeps them both in check. Without a strong leader in the Presidency, Congress can go very awry. Can Presidents go overboard? Absolutely, but so can Congress. Keep in mind, someone will be leader, if its not the President it will be the Speaker — someone the nation as a whole doesn’t get to vote for (or under your legislative election reforms will likely represent considerably less than half the country). In short, my goal isn’t to find a head of gov’t that people like, I’m looking for a way to find the best person for the job. There’s nothing that says that person isn’t someone that almost half the country hates. Approval voting turns it into even more of a popularity contest than it already is. OK, this is where you and I really part ways. This puts way too much power in the hands of party bosses. Under this system no representative will ever go against the party bosses because its not the people who elected them its the party bosses that appointed them (by deciding who goes where on the list). Talk about an incumbency problem, sheesh. Why bother even having multiple representatives from each party? Just apportion out the vote in the House by the percentage they won in the last election. The one Democrat gets 45%, the one Republican gets 44% and the rest get their respective amounts. Those few extras would then have outsized influence because they control the swing votes. I don’t get how anyone could think this would work to the people’s advantage. Once again this will cater to fanatics. If some weird cult can manage 1% of the vote (not that hard) and that 1% turns out to be the swing vote, they get to essentially dictate legislative policy for 2 years? Right now legislators can (and do) break with their party because they have a constituency, they are ultimately responsible to some *identifiable* portion of the people. Taking that away and only making them responsible to the party with only a vague identification with some unknown, unidentifiable, unnameable portion of the public is a really really bad idea. RE: number of seats in the House. You and I completely disagree here as well. I’d like to see somewhere between 4 and 10 times as many House members myself. With modern technology there’s no reason they all have to meet in the same room to conduct business. Yes, it’d be more unwieldy but that’s the point, make it harder for Congressional leaders to strong arm representatives, make it harder and more expensive for lobbyists to ply their trade, make it harder for backroom deals and pork barrel projects to swing votes — and by shrinking district sizes its much harder to make gerrymandering effective. Reducing the size of the House takes our gov’t even further away from being “of the people”. As it is our gov’t is of, by and for lawyers (and bureaucrats) more than it is of, by and for the people. This issue with voting is basically the cause of the current political chaos in the UK. We are nowhere near the end of dealing with the ramifications of the nationwide referendum we had almost three years ago. If we ignore the fact that campaign promises can be misleading, and that people can change their minds (which our politicians are ignoring, even though they shouldn’t), we have a situation where a small majority of voters are unhappy with the status quo in our relationship with our European neighbours, and want to see it significantly changed. However, for each of the actual options for the future, a majority of the electorate feels that it is worse than the status quo. We have an executive who say that, having held a public yes/no vote on the status quo, likewise holding a yes/no vote on a specific way forward would be a betrayal of democracy. We have a legislature who say that they’re not going to endorse a way forward that harms the population. We are thus somewhere in the middle of a constitutional crisis. It would be funny if it weren’t doing so much harm. The two houses we have now can’t seem to agree on anything lately. A third house would bring everything to a screeching halt! 40% of the voters did not want to recall the incumbent so most of them voted to keep him in office. Duh! Without a single strong alternate the plethora of alternate candidates ensured that their votes will be dispersed among the field to be below the incumbent’s. Even with just two alternate candidates, if their votes were split evenly the incumbent would have won [35% vs (100-35)/2=32.5%]. Additional candidates just increase the likelihood all alternates receive votes below the threshold from the hard-core incumbent supporters. The problem is the combination of a plurality system and allowing the incumbent on the ballot which is just silly. The described result is not an anomaly but will be a common result of these rules — either disallow the incumbent’s re-election or have a run-off (physical or preferential). Remember, the incumbent is the incumbent because he got elected in the first place. This means wide name recognition and organized supporters. In the real world, most recall elections are going to be much closer than 60-40%. In the discussion of various voting methods it seems to me that most of the examples and counter-examples are contrived –- i.e., they do not reflect real world conditions and may lead to invalid conclusions. Real world elections are not black and white but have a spectrum of combinations of choices. There are (almost) always multiple issues, the candidates have multiple combinations of stances on these issues and the voters have a range of desired/acceptable preferences. While contrived examples allow any combination of candidates and voter preferences, in real elections combinations of diametrically opposite viewpoints will not appear –- both within a single candidate, voter or candidate/voter pair. For example, one would not see a white supremacist candidate promulgating anti-discrimination laws, conservatives promoting universal health care or Republicans advocating for voter rights. Likewise, a racial minority voter is hardly prone to vote for an avowed racial bigot, an environmentalist to vote for a big oil proponent or an extreme liberal voter to vote for an extreme conservative candidate. The combinations of individual candidates’ stances and voter’s preferences on various issues do not encompass an entire spectrum but will each cluster somewhere along an ideologic line. This will require a much more sophisticated and complex analysis but should yield much more useful results. In the strictly mathematical analysis in Richard’s link, candidate A (above link), had 18 die hard supporters but was ranked last by all of the remaining 37 voters, That implies he was ideologically isolated from the majority of the population so why was he the most popular? Also, there was absolutely no variation in the ranking of the other candidates by his supporters. Real world, general public voting systems absolutely must be simple. Given that some voters cannot handle single choice selection correctly –- anything more complicated than a many candidate ranking system is unrealistic. Likewise, voters should not and cannot be expected or required to rank all of the available candidates –- either because of non-recognition or because of opposing ideology. I feel some sort of ranking voting system is an absolute necessity for keeping a democracy vibrant and alive. They would better reflect true voter preferences, prevent “keep out” defense voting, minimize “spoiler” candidate effects and increase voter (feelings of), empowerment. Single choice selections lead to entrenched two party situations that stifle change and new ideas, lead to voter apathy and ideological polarization. Districting/redistricting is the process of dividing up an area into relatively equal-sized voting populations. The theoretical purpose was to group like-minded, similarly motivated people together. OTOH, gerrymandering is an abuse of that process in order to ensure/facilitate the re-election of party-in-power candidates. Gerrymandering was first practiced in 1812 by Massachusetts Governor Elbridge Gerry, from which it gets its name. It has nothing to do with commonality of voter interests. Looks like gerrymandering could not be a more timely topic. The US Supreme Court has taken up the cases of gerrymandering in Maryland and North Carolina and there is hope that a non-partisan, mathematical redistricting criteria may be imposed. If so, it would set a precedent for and facilitate the elimination of egregiously gerrymandered states in the US such as Texas and Wisconsin.